Whether you’re typing up an essay, simply scrolling through a web page, or gaming your night away, more often than not, these activities in some way involve your keyboard. This vital utility can come in every size and shape imaginable, and most of us have extremely personal preferences when it comes to what it is we type on. 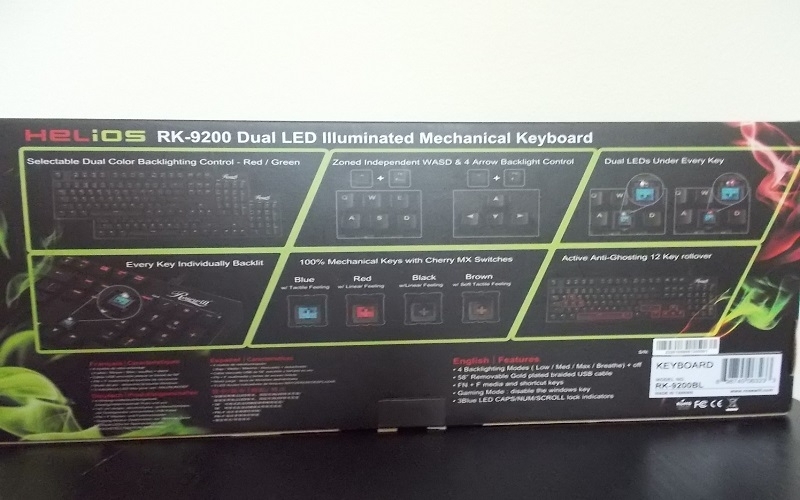 Today for review, we have the Rosewill Helios RK-9200 mechanical keyboard. This portable, dual-illuminated, Cherry MX Black equipped keyboard comes with many surprises, and starts at around $139.99. Lets take a closer look. Before we go anywhere, though we have to point out that this is a mechanical keyboard, which means that under every single key, there is a real switch, much like the light switch in your wall. Each key stroke operates a mechanical switch which completes the circuit, unlike the membrane depression technique we see in full-membrane and scissor-switch keyboards in many desktop and laptop keyboards. Mechanical Switches come in all flavors, but most of them are subject to three classifications. Most switches are either tactile or linear. Tactile switches have a light(or sometimes not) tactile indication halfway through the key press which tells you that the key can be released. Linear switches, while still actuating the circuit at the halfway mark, have no tactile feedback system. On top of the linear and tactile dichotomy, there is the “clicky” option for mechanical keyboard switches. With these keyboards, each key-press is accompanied by an audible “Click”. 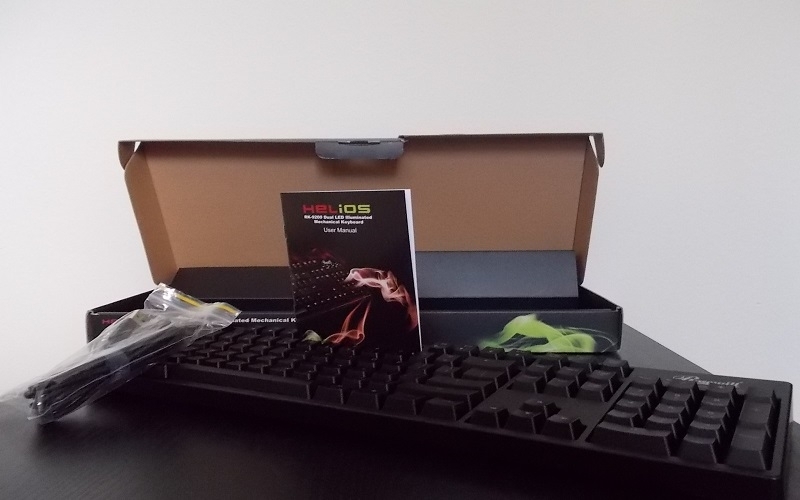 The Helios is equipped with Cherry MX Black switches, which are linear and have no click. The MX Blacks have the highest actuation force of the Cherry MX family- 60g (40g to 80g overall) and provide the stiffest resistance to accidental key-presses. The stiffness doesn’t stop the action from feeling smooth, however. Having the actuation and release points at the exact same position helps the MX Blacks achieve the best double-tap accuracy out of the whole Cherry family. The stiffness, protection against accidental hits and double-tap ability make these switches perfect for gaming, as the tactile bump isn’t necessary as most gamers tend to bottom out in their key-presses. And worry not; the Helios is available with Black, Brown(tactile and silent), Red (for all intents and purposes, the Red is a softer Black) and Blue(Tactile and clicky) MX switches for all tastes to enjoy. In the box you get the keyboard, a micro USB for it, and an instruction manual. On the inside of the box, there is also a convenient diagram of the Fn key shortcuts and their functions. The keyboard shell and keys are a matte black, and the layout of the keyboard itself is very minimalistic. There are no macro keys, or any additional keys barring the Fn key, which is placed in between the right side Alt and Ctrl keys. 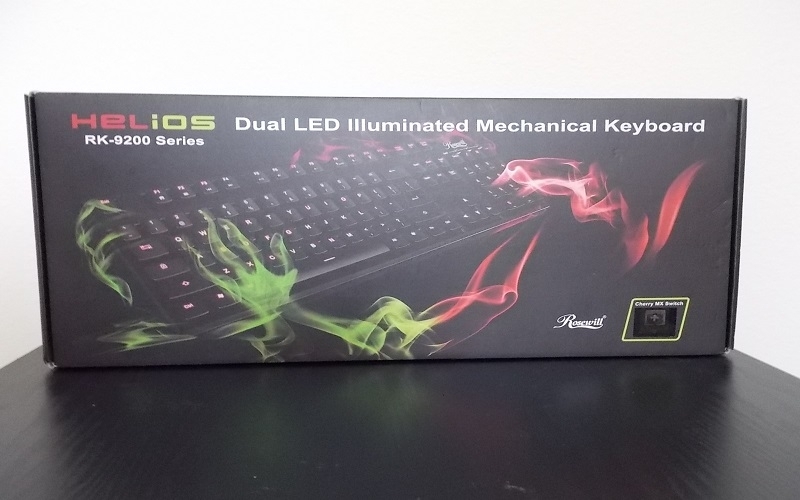 The Helios, like any self respecting gaming keyboard, features anti-ghosting, allowing the board to recognize up to 12 simultaneous depressions. There is also a gaming mode which disables the windows key (signified by a lack of back-lighting when enabled). There are also system shortcuts, which consist of combinations of the Fn key with the F1-F8 keys, which will skip tracks, and open up emails and browsers, without any additional installation. The keyboard connects by means of gold-plated, micro-USB which is detachable from both the PC and the keyboard. While I like my keyboards to be hard bound to their wires, I have been told that this could prevent damage to the wire by disconcerting it, should the keyboard ever fall of the desk, or receive some other form of undue force. I suppose this means that if you would ever want the mechanical keyboard on the go, the Helios could also be quite portable, even if it is a bit on the heavy side (2.6 pounds). I found my experience typing on this keyboard to be an absolute blast. The keystrokes are articulate, and the sound of the mechanical keyboard is music to my ears. It is a bit loud, apparently, as the click-clack of this review could be heard behind a closed door, although it could very well be my typing style. The keys are great to the touch, and the keyboard blends in well with the generic electronic black. When gaming I found the force required to depress the keys beneficial, as it helped to avoid errors. Overall, I’m smitten. 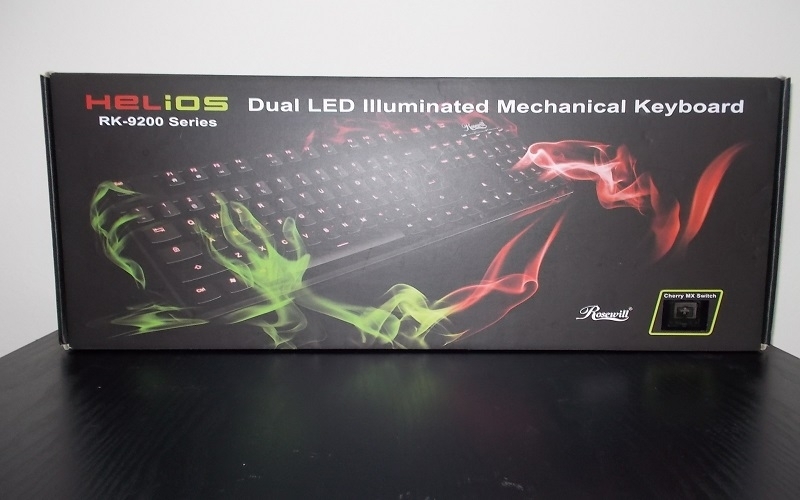 When I started this review, I wasn’t too big a fan of mechanical keyboards. In my time of not having one all they did was cloud Skype calls with unneeded racket. But after typing on this little machine for a bit over a week, I can say I’ve been converted. The sound and responsiveness is just too fun, call quality be damned. The lowest brightness setting may as well not be there. 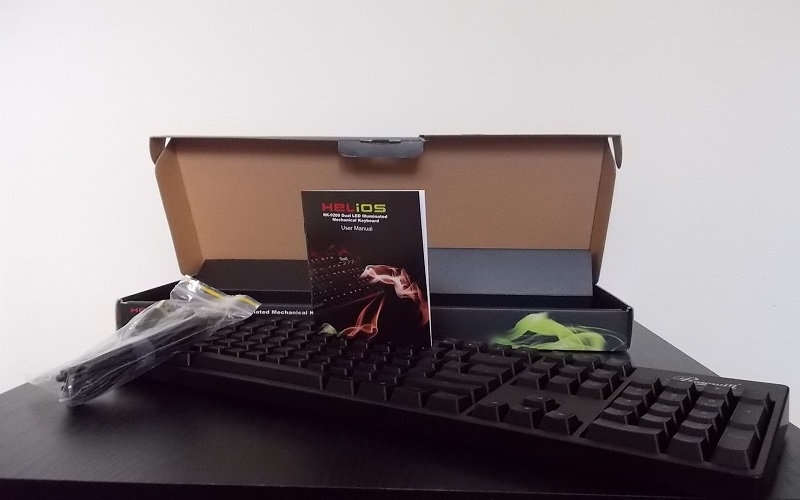 At $139.99, the Helios is in line with other Cherry MX Switch keyboards in terms of price, and I can’t say anthing negative about Rosewill’s build quality. It’s a great addition to any rig, and I could see it doing very well at the lan party scene.